Francisco Kjolseth | The Salt Lake Tribune An aerial view of the NSA's Utah Data Center in Bluffdale, Utah, Thursday, April 18, 2013. T Trent Nelson | The Salt Lake Tribune Utah Lt. Gov. 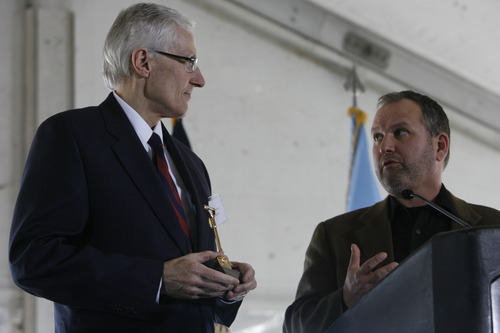 Greg Bell, left, receives a miniature golden shovel from Harvey Davis, director for installations and logistics at the National Security Agency, during the groundbreaking ceremony for the Utah Data Center on Jan. 6, 2011. Francisco Kjolseth | The Salt Lake Tribune An aerial view of the NSA's Utah Data Center in Bluffdale, Utah, Thursday, April 18, 2013. 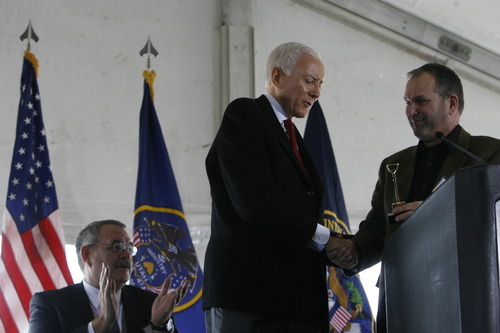 T Trent Nelson | The Salt Lake Tribune Sen. Orrin Hatch, left, receives a minature golden shovel from Harvey Davis, director for installations and logistics at the National Security Agency, during the groundbreaking ceremony for the Utah Data Center on Jan. 6, 2011. American cyberspying has the potential to harm its citizens and interests abroad, two computer and security experts said Tuesday in a Trib Talk online video chat. The Salt Lake Tribune chat at sltrib.com focused on the National Security Agency&apos;s Utah Data Center. The $1.5 billion data storage facility is under construction in Bluffdale and is expected to be open in September or October. It was the subject of a recent Tribune series. Recent disclosures about the vast NSA data collection programs will make foreign governments and companies hesitant to buy American products and to adopt American standards, including cloud computing and free speech on the Internet, said Alan Friedman, a fellow and researcher at the Brookings Institution. "The United States government is in a position through its technological sophistication... to gather an unprecedented amount of data on everyone," he said. 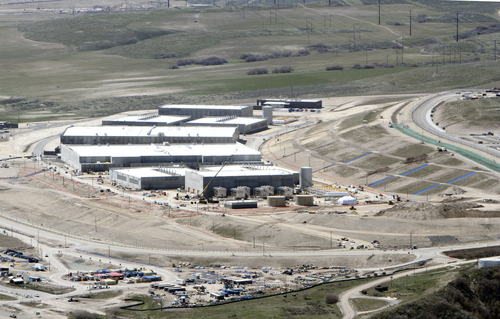 The NSA has indicated no data analysis will happen at the storage center in Bluffdale. Instead, it appears NSA employees and American allies will be able to log in to a secure system and analyze the data from locations across the globe. Tribune computer-assisted reporting editor Tony Semerad, who contributed to the newspaper&apos;s series, said while some have characterized phone metadata as anonymous, research indicates it can teach much about individuals. "You call your doctor, you call your mistress, you call a journalist. This stuff would be relatively easy to render from metadata," Semerad said. 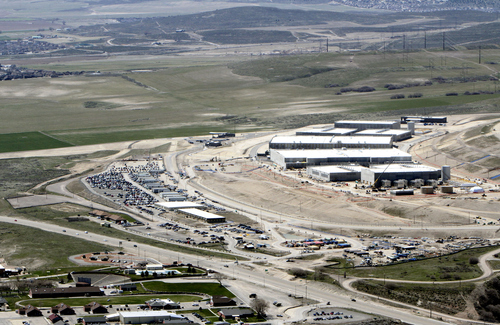 The Utah Data Center is expected to hold thousands of zettabytes of information. 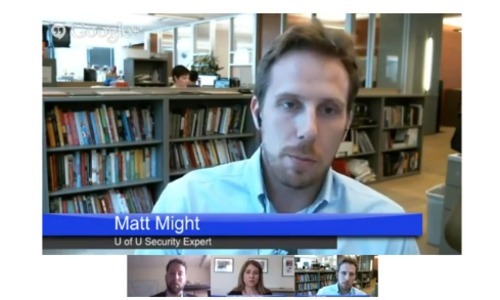 University of Utah computer security expert Matt Might said when there&apos;s that much data, it makes it more difficult to sort and create something usable or to find what you&apos;re seeking  in this case, a terrorist. "Most of the time it&apos;s not a terrorist," Might said. "Most of the time it&apos;s a false positive." While the NSA works on that technological problem, Might worries foreign governments will be able to hack into the NSA databases, obtain the data and use it to spy on Americans. "The military [computers are] compromised routinely," Might said. "I don&apos;t think the NSA is all that different." An ABC News/Washington Post poll published June 19 said 58 percent of Americans favor the NSA collection of metadata. But Freidman thinks more people are starting to pay attention to the data collection. "If we are going to make this trade-off real, we need some very clear understandings of what the benefits are," Freidman said. "And I don&apos;t think we have those."